Where In St Louis Have Home Prices Increased (or Decreased) The Most? St Louis home prices have been, for the most part, increasing over the past couple of years at what most would consider from a historical basis, a “normal” rate. However, market conditions can vary widely from neighborhood to neighborhood as illustrated by the table below which shows St Louis zip codes where homes prices (on a per square foot basis) have increased the most in the past year. 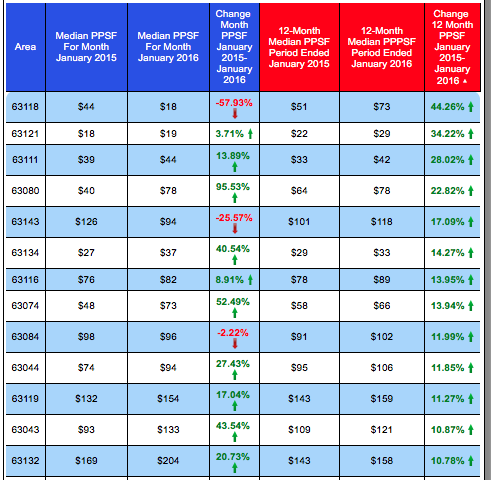 As the table shows, there are 13 zip codes in the St Louis area where home prices, on a per foot basis, increased over 10% during the 12 month period ending January 31, 2016 from the prior 12 month period. Four low-priced zip codes are at the top of the list with the first triple-digit price per foot area making the list being the Maplewood area (63143). At the other end of the spectrum, shown on the second table below, are the zip codes where home prices declined during the same period. Fortunately, there are only 3 zips on this list with the Ferguson area, 63135, at the top, followed by Bellefontaine Neighbors (63137) and DeSoto (63020). Search ALL Homes For Sale – Updated MLS-Direct Every 5 Minutes! Where in St Louis Did Home Prices Increase and Decrease The Most in 2015?